We have already written extensively about the plans for the new Pizzeria da Marco in Bethesda, and last night we were finally able to try the pizza we had heard so much about. Just a week old, the restaurant is offering a special of half off all their pizzas till the end of May. We made sure to get over there last night to take advantage of the offer while we still could! Entering the large space, I have to admit I was pleasantly surprised by how nice it was. 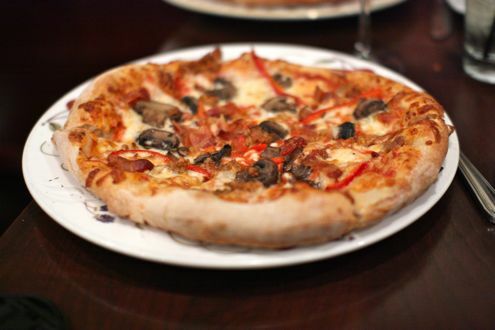 It resembled more of a nice restaurant than a casual pizzeria. With white table clothes, friendly waiters, and an extensive wine list, this was drastically different from standing in line to place an order at somewhere like Pete’s. Not that we don’t love Pete’s (because we really, really do), but this was a very nice experience overall. After being seating as soon as we arrived, our waiter came by and explained the concept since we said it was our first time there. 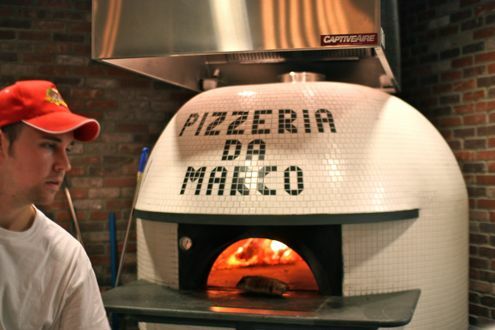 The pizzaiolo came from Naples with more than 20 years of experience, along with their trademark 900 degree oven. 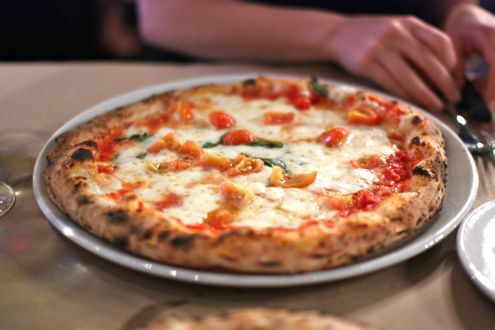 All of their ingredients are imported from Italy, and when the menu says tomato sauce, it is actually fresh tomatoes that liquefy on the pizza during the high heat cooking process. Sounds good to me! We each ordered a glass of Pinot Grigio at an inexpensive price of $6 and quickly made our pizza selections. Even if we didn’t know about the 50% off special, the prices at Pizzeria da Marco were fairly reasonable for individual pizzas. I went the traditional route and got the Margarita P.O.C., which came with tomato sauce, cherry tomatoes, basil, buffalo mozzarella, and Parmigiano. The waiter said I couldn’t go wrong with that choice, and he was right. Now, we have seen some early reviews that lament on the soupy quality of the middle of the pizza. I have to admit, my pizza wasn’t something you could easy pick up by the piece. However, as I cut it with a fork and knife, I couldn’t get over the freshness of the ingredients and how well they went with the doughy crust with a light char on the outside. We discovered another way to eat the pizza is to fold the pieces like you would eat a New York slice, because they are not as crispy as say a slice from Vace. The Feast posted an enlightening video of Executive chef Dino Santonicola explaining the difference in Neapolitan style pizza, and his explanation of juiciness may be more accurate than soupy. The insides of the cherry tomatoes might have contributed to that texture as well. Brett ordered the Marco, which was prepared with tomato sauce, smoked mozzarella, mushrooms, Parmigiano, and sausage. His pizza appeared to be a little crispier than mine, but he also remarked on the high-quality ingredients and how fresh everything tasted. The bits of sausage scattered atop the pie were rich in flavor, not too dry, and complemented the smoked mozzarella and liquefied tomatoes. Our waiter even brought out some fresh olive oil that he recommended we dip our crusts into, and doing so brought out more robustness to our pies. 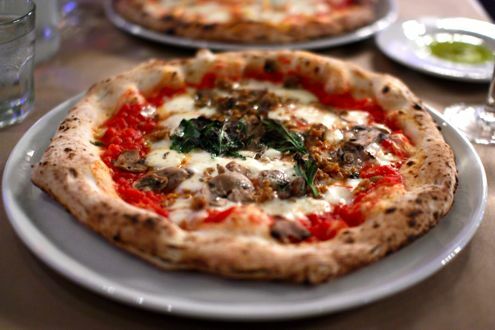 I’ve been to Naples and had their pizza, so I feel comfortable in saying that Pizzeria da Marco is the real deal. The best comparison we can make to other pizzerias in the area is 2 Amy’s. Like 2 Amy’s, Pizzeria da Marco also doesn’t slice their pizza, but with the sharp knives they provide, I didn’t feel like I was giving myself a workout trying to saw off a piece compared to the aforementioned Cleveland Park restaurant. We brought back home some leftovers of my pizza, but alas, it was too tempting sitting in the fridge and the rest was gone by the end of the night. Overall we were very impressed with the food, service, and atmosphere of Pizzeria da Marco, and will definitely be making frequent appearances to this new Bethesda establishment. Pizzeria da Marco is located on 8008 Woodmont Avenue in downtown Bethesda. After months of renovations to the old Rock Creek space on Elm Street in Bethesda, Newton’s Table opened its doors several weeks ago. While they were initially open for dinner, they have started offering lunch and happy hour service as well. Some of us decided to check out their happy hour to see if it would live up to expectations as a new Bethesda destination. We arrived at the restaurant and went straight for the bar, which wasn’t particularly crowded for a Thursday evening. The actual layout wasn’t much different from its former tenants, but the colors were inviting and tasteful. For happy hour, Newton’s offers several food items at a discounted price, such as Wagyu beef sliders for $10, $5 Gougeres (or French cheese puffs), $3 per salt and pepper shrimp, $5 rosemary Parmesan fries, and a $2 buffalo chicken egg roll, which debuted that evening. Drink specials consisted of $3.50 drafts, $5 rail drinks, $6 wines, and $7 specialty martinis. Nothing was much of a steal, but the food was definitely of higher quality than some other happy hour joints we frequent. The sliders were excellent and you could taste the intense flavor of the meat. 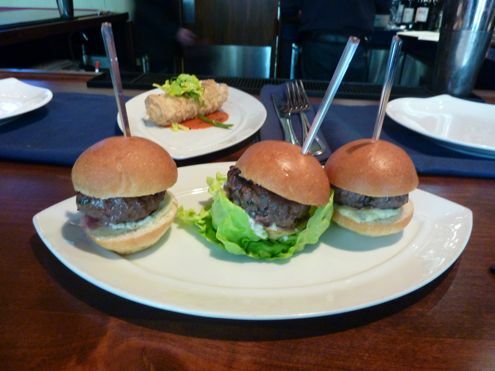 Still, $10 is a lot for three small sliders, even for happy hour. Same goes with the $5 fries. 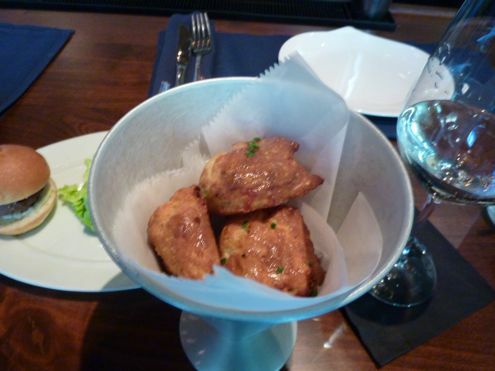 The Gougeres were different as they were light, airy, and a fun dish to split. For only $2, I hope the egg roll remains on the happy hour menu as it was definitely the best deal of the night. The beer list wasn’t extensive, but Brett ordered a Stella and a Sierra Nevada for $3.50 each, so he wasn’t complaining. My friend and I each had a glass of wine, but there was only one white and red option. Not that it was a problem, but it is nice to have some more options for happy hour. While we were at the bar, we asked to look at their lunch and dinner menus. The dishes sounded tasty, but our excitement waned as soon as we saw the prices. Suddenly, Newton’s became a special occasion restaurant, aside from their happy hour deals. Most of their dinner entrees ranged in the high 30s, and lunch was in the upper teens to 20s. The most inexpensive item for dinner was a $16 hamburger! I’m not sure what would justify that price for a hamburger, but considering that we just had Ray’s Hell Burger for $7 per person, those are high expectations to live up to. That’s not to say I don’t want to try many things on the menu at Newton’s, but there would have to be a compelling reason to go and spend the high prices there. We also strongly recommend they work on their website, and fast. It is great that new restaurants like Newton’s are using social media sites like Facebook to create a fan base before opening, and that’s what they were able to do. They slowly started posting food descriptions and snippets of the menu after opening, but we still have yet to see a full menu, and only saw the surprisingly high prices once we arrived at the restaurant. At least potential customers would know before visiting what type of dining experience they are in for if they saw the menu and prices beforehand on their website. While it’s a little out of the way for a midday meal during the workweek, BlackSalt offers one of the best lunch deals in the District. For $18, diners can choose three items from four categories: a starter, entree, dessert, and an alcoholic beverage. For just $5 more, diners can create their own four-course meal. 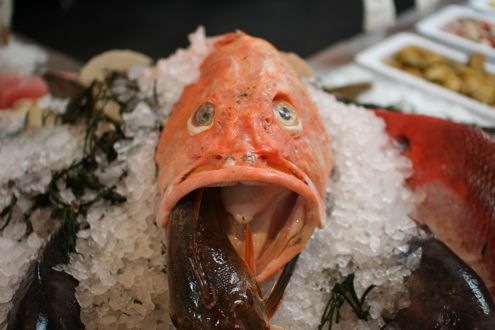 We had heard about this special via Metrocurean as we have been dying to try Jeff Black’s standout seafood restaurant for what seems like an eternity. Rachel and I decided to head over last Friday since we both had the day off and wanted to take advantage of this excellent special. We have always heard about their fish market, which is situated in front of the house, but were taken aback by not only what BlackSalt sold, but by how fresh everything looked. 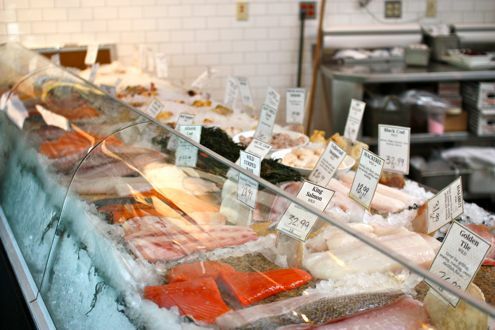 From salmon to oysters to tuna cakes, one wouldn’t typically expect a fish market in the quaint Palisades neighborhood, especially one with such an impressive selection. While we held off on buying fresh fish that day (prices aren’t for the faint of heart), we’ll certainly be back for those tuna cakes. We made our way towards the dining room in the back and looked over the menu. Both Rachel and I opted to skip dessert and instead focus on the appetizer, entrée, and drink (of course!). Rachel got a glass of sparkling wine, baby arugula salad, and the cornmeal crusted tilapia sandwich. The salad came with lemongrass-almond vinaigrette, feta, and dried cranberries. 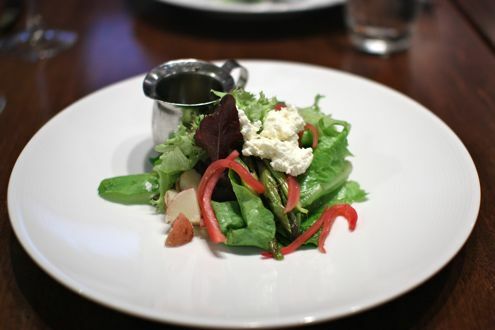 The salad wasn’t terribly inventive, but she loves that particular combination and it was a great start to the meal. Brett ordered a glass of the white wine, the local vegetable salad, and the wood-grilled big eye tuna sandwich. We actually wound up splitting our sandwiches so we each could have a half of one another’s. The tilapia was crispy on the outside but incredibly tender and flaky inside. It tasted like it was flash-fried which pleasantly made the sandwich not too heavy. It arrived on toasted ciabatta with avocado and pickled red onions. 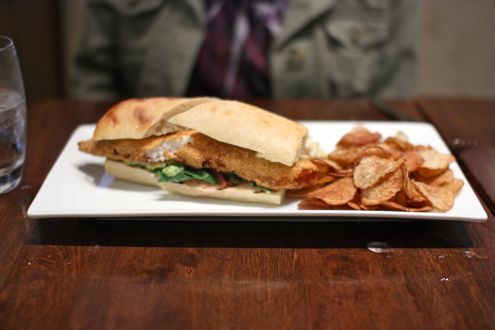 Rachel’s sole complaint was that the ciabatta was a little too tough when biting into the sandwich, and that the fish didn’t really need the bread in order for it to shine. Meanwhile, the tuna sandwich was excellent. Prepared on housemade focaccia and dressed with olive persillade and smoked tuna tapenade, the big eye was cooked to (at least in my opinion) perfection. 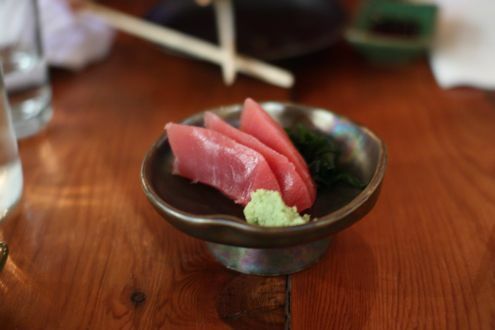 The kitchen hit that sweet spot between rare and medium rare, and the quality of the fish itself was first-rate. While I enjoyed persillade and tapenade, I felt that it was a little excessive as it detracted from the fish and nearly masked its flavor. The bread was able to withstand the dressing as it didn’t get too soggy, but I think I preferred Rachel’s tilapia if I had to choose between the two sandwiches. 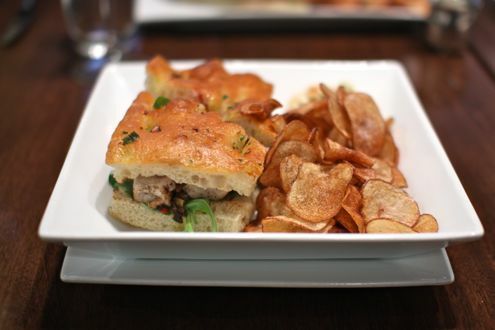 Both sandwiches also came with a side of generous portion of highly addictive house made potato chips. While we could have added dessert to one of our meals for five dollars, we instead bought a homemade chocolate chip cookie from the market for a buck. It was well worth the money spent as the entire cookie was soft and gooey and was a nice ending to a fabulous meal. We can’t recommend BlackSalt’s Lunch Break enough. For the money, it’s seriously one of the best deals you’ll find in the city, period. The quality of the food is beyond fresh, the service is attentive, and the atmosphere is tranquil given the neighborhood surroundings. It’s well worth the trip. We have always been big fans of Persimmon, so naturally we were thrilled to hear that the owners were opening up a casual restaurant in nearby Cabin John. While the food and service at Persimmon is top notch, we appreciate an informal alternative that’s friendly on our wallets as well. We met our friends Dan and Judy for dinner there on a Saturday night at around 9pm. It’s a good thing we waited till then to head over as they do not take reservations, plus the place was packed! The small restaurant is situated in a strip mall on MacArthur Boulevard and is roughly the size of Olazzo in Bethesda in regards to dining space. As we waited for our table, we were able to find two stools by the bar in the back to congregate by, so we ordered a bottle of Riesling to share. After a few minutes we secured a table and, after glancing at the menu and what other diners were eating, we knew right away we had to try some of their pizzas. 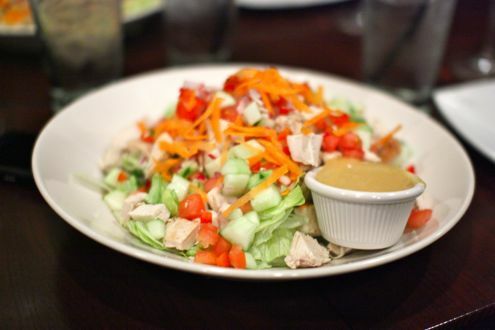 Wild Tomato’s menu is primarily comprised of starters, large salads, 12″ pizzas, sandwiches, burgers, and reasonably-priced entrees such as salmon and roasted chicken. We decided to keep it simple, so each couple ordered a chicken-chopped salad and a different type of pizza. The salad was fine, but we all agreed that we could have done without it. There was nothing that stood out and we were a little disappointed with how bland it was. Brett and I had the Smokin’ Pizza, which came with bacon, marinated red peppers, mushrooms, smoked mozzarella, chorizo, and spicy tomato sauce. The pie definitely lived up to its name and you could certainly taste the smokiness. I would order that pie again, but perhaps with a plain pizza too in order to balance out the strong flavors. While there is no shortage of casual sit-down pizza establishments in the area, Wild Tomato definitely has a neighborhood feel to it. The Maryland mascot, Testudo, was drawn on the blackboard, along with “Go Navy” and “Go Rams” illustrations. So while everyone in the Rockville vicinity is still waiting in two hour lines for Matchbox during the weekend, it is definitely worth giving Wild Tomato a try instead. 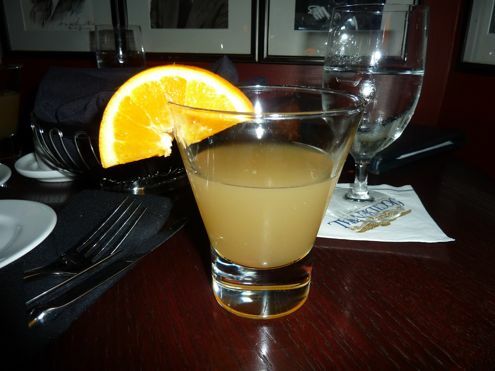 As much as we love going out to dinner, sometimes all you need is a great happy hour. And during the month of May, I think Occidental may hold the title for the best deal out there. One of the oldest establishments in the District, Occidental is celebrating its birthday by offering some of its classic cocktails at its original 1907 prices of 18 cents. At first it seemed too good to be true, but then we learned that there was one catch: the 18 cent cocktail was valid for the first drink only, and had to include the purchase of a food item. I remember going to the Occidental years ago for my first ever Restaurant Week experience and being amazed by the countless portraits on the walls of Washington’s elite, from presidents to sports figures. We sat at the old-fashioned bar and you could just feel the history within those walls. My friend and I both ordered the Cable Car, which was a mixture of rum, orange liqueur, and fresh lime juice, topped with an orange slice. It was incredibly refreshing, and quite strong! To eat we shared the tuna tartar and risotto balls, along with the basket of fresh rolls and butter that came out with our food. The bread was just out of the oven and came with butter that had a hint of basil in it. 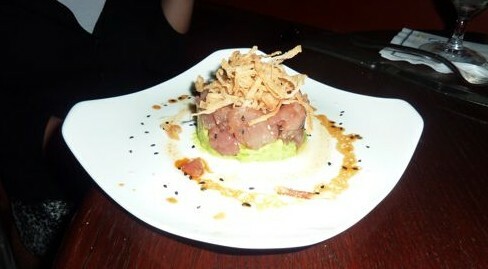 The tuna was layered with avocado and crispy onions on top, which added a nice crunch to the creamy dish. 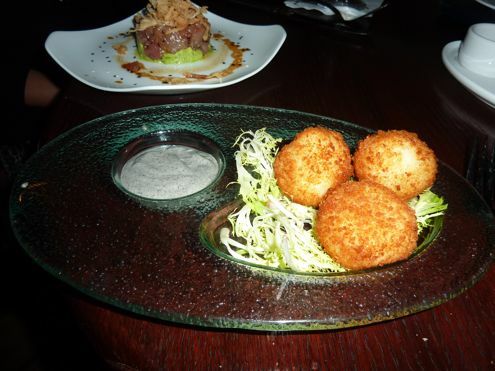 The rice balls were crispy on the outside and came with an olive dip that nicely complemented each other. All in all, we spent $10 each on a fantastic cocktail and appetizer. I highly recommend checking out the Occidental before the deal is over. Occidental Grill & Seafood is located on 1475 Pennsylvania Ave NW in downtown DC. 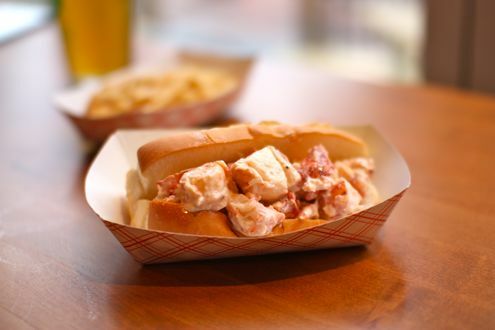 Freddy’s Lobster and Clams has been on our list of new restaurants in Bethesda whose openings we have been eagerly anticipating. 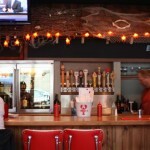 By chance, we discovered a soft opening this past Saturday and quickly made our way over. Right away, we could tell that this place was going to become a new Bethesda staple. 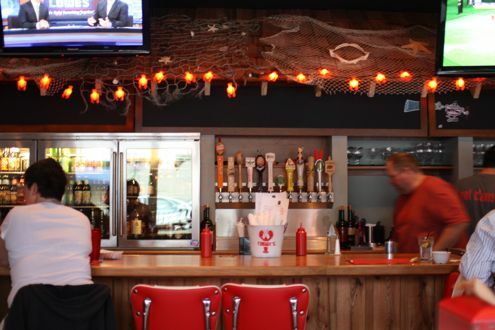 Freddy’s is the brainchild of Grapeseed chef and owner Jeff Heineman, who has always dreamed of opening a lobster and clam shack. He named the restaurant after his grandfather who he used to spend the summers fishing and catching clams with. The idea sounded like something very different in Bethesda and we couldn’t wait to see it for ourselves. Wooden picnic benches graced the outside patio while brightly colored red booths and communal tables welcomed us inside. There weren’t any tables available in the dining room or right at the bar, so we grabbed some seats facing the window in the bar area. All along the walls were signs from New England as well as fishing equipment and memorabilia. There were even a line of t-shirts for sale with the restaurant’s logo in various styles. 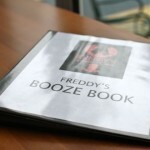 While we were waiting to order, we decided to delve into the drinks binder (aka Freddy’s “Booze Book”) which featured an extensive (and reasonably priced – especially for Montgomery County standards) beer list. Brett ordered the Troeg’s Cappuccino Stout while I got the 21st Amendment Hell or High Watermelon, since I had been meaning to try it and was curious to see how it tasted. Drinks in hand, we decided to order two staples for dinner – Brett got the fried clam strips basket (with onion rings) and I got the lobster roll. I’m a huge fan of all things lobster and couldn’t wait to compare this one to other popular rolls in the area. When our food arrived, we could see just how casual this place was. Everything came in red and white paper containers while condiments were already on the tables. We did have to ask our waiter for silverware and waters, but we’ll chalk that up to it being their first day. I thought my lobster roll, served chilled with mayo, was fresh and delicious. It was mostly chunks of meat as opposed to whole claws or mixed like a salad. The roll was nicely toasted and buttery, but I only wished that there was a little more meat in it as it seemed small compared to competitors such as Red Hook Lobster Pound. Then again, while the two charge the same price for the roll ($15), Freddy’s also threw in a side of fries. Brett’s platter of clam strips and onion rings resembled something you would typically find at a fish fry, the image Freddy’s is striving for. 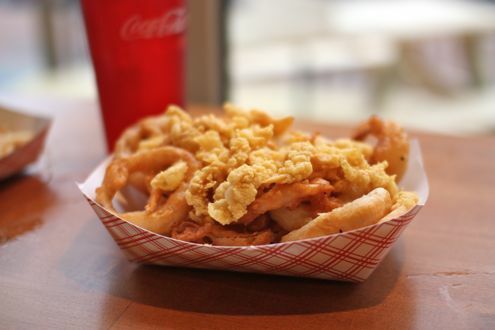 While the onion rings were huge and crispy, they tended to overshadow the small clam strips. Then again, this was their soft opening so there will be plenty of kinks to be worked out (such as Brett’s aforementioned 3:1 onion rings to clams ratio). We informed the waiter about our qualms and he said that he would pass the word to the chef. Our host was definitely disappointed that we didn’t have as fulfilling of a meal as he had hoped, but we’ll definitely be back to see how the kitchen progresses. It is always difficult to judge a restaurant when it opens, especially during its first few days. The official grand opening for Freddy’s is this Tuesday, but they decided to open early last Saturday for a trial run. We were definitely glad we got to check the place out. 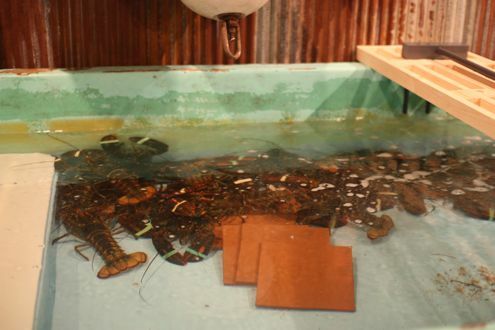 This casual establishment isn’t pretending to be anything other than what’s part of their name, which is lobster and lots of fried food. So while you may leave feeling a little guilty from eating excessive amounts of deep-fried deliciousness, it’s definitely a fun, laid-back venue. 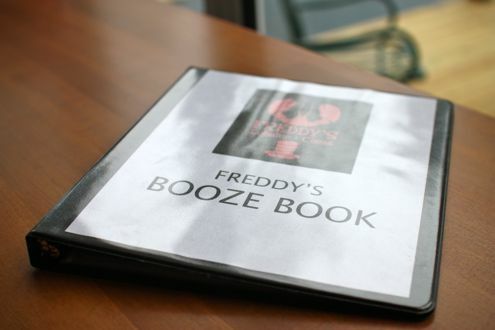 And we’ll definitely be back to sit at the bar and explore all the many beers and fun drinks in that binder. 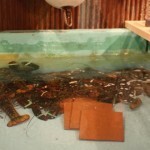 Freddy’s Lobster and Clams is scheduled to open on Tuesday, May 17. They are located on 4867 Cordell Avenue in downtown Bethesda. 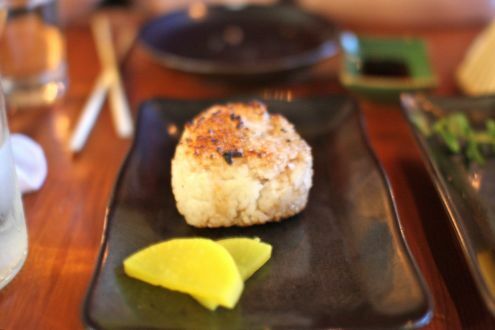 Rachel and I have been meaning to try Kushi for what seems like an eternity, and given that our LivingSocial certificate was about to expire in a few days, we had to act fast. We decided to make a reservation last Monday since it would not be as difficult as opposed to securing a table later in the week. 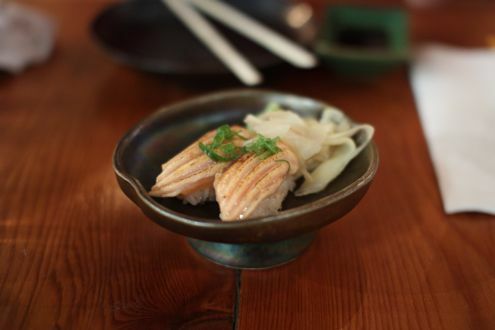 Kushi Izakaya & Sushi, which is a part of the CityVista complex, has garnered positive reviews since opening early last year and is the only Izakaya-style restaurant in DC proper. Considering that both Rachel and I are adventurous when it comes to food (which was taken to the nth degree at Sushi Taro), Kushi was right down our alley. When we arrived, our waitress greeted herself while explaining the menu and how to order. For us first-timers, it was intimidating to say the least. The menu is divided into several categories which range from small plates to grilled skewers to sushi. After taking a considerable amount of time to review the menu, we were finally ready to place our order. We started the evening off with the ginger fried chicken. The chicken must have come right out of the fryer as it was piping hot. Not anything amazing but the soy dipping sauce was rather addictive. We should have gone with the Kawa (crispy chicken skin) instead. Up next was Onigri, or crispy rice ball. Kushi offers Onigri as a daily special and rotates what ingredients it uses – that night the kitchen used pork as its featured protein. Considering that it was only $3, this was more of my choice than Rachel’s as I was curious what it would taste like. While I enjoyed the texture of the grilled rice and how it created a cohesive outer layer around the pork, we probably could have done without it as there were simply better options on the menu. 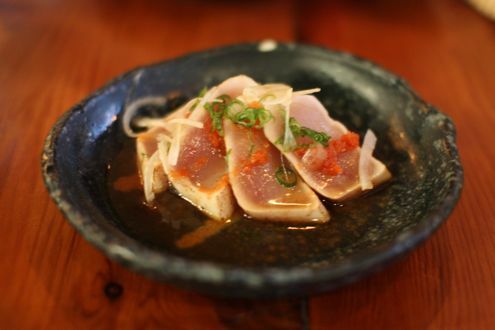 Speaking of which, our next plate was the tuna tataki. One of the more authentic items of the night, I really enjoyed this dish as the ginger and vinegar hit a nice balance with one another. Rachel, on the other hand, initially thought it would resemble more of a tuna tartar so she wasn’t the biggest fan after a few bites. While Rachel may have been disappointed with the tataki, we both adored the pork belly skewers. 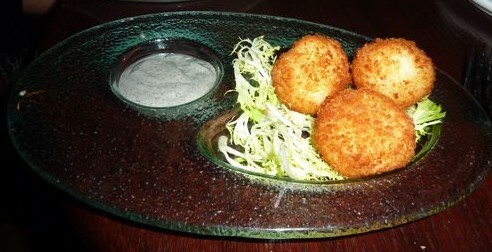 One of the restaurant’s most popular dishes, these were simply fantastic. 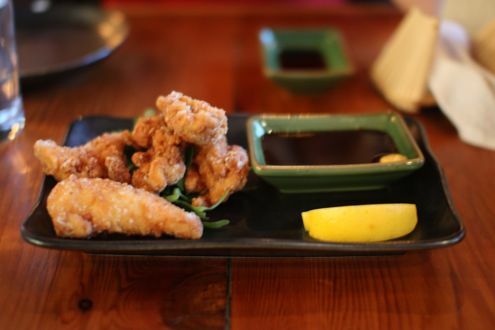 Tender and succulent, these are a must-order should you ever dine at Kushi. Futhermore, our order of bacon-wrapped asparagus was on the very same plate. I don’t have to remind you that anything wrapped in bacon is automatically considered a success, do I? Up next was an order of Japanese eggplant. While the sauce was a little too sweet, this proved to be another solid choice. The grilled eggplant was excellently prepared and nearly melted in your mouth. Highly recommended. 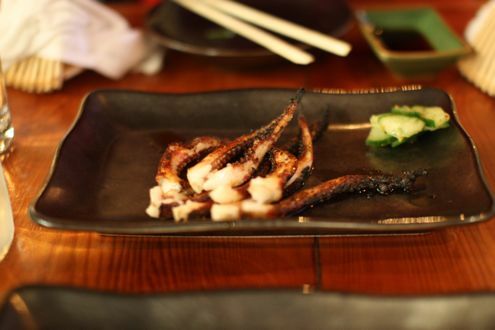 Continuing our selections from the robata (wood grill), our next plate was Geso, or grilled squid legs. 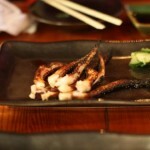 The char really enhanced the overall flavor of the dish while the squid was not as chewy as anticipated. We were both very happy how this item turned out. After several plates from the robata, we finally moved onto the sushi. 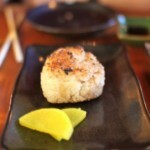 The seared sea scallop maki was excellent – one of our favorite sushi courses of the night. Meanwhile the beef maki was a little too overwhelming, both in size and execution. Considering all the other plates we ordered, the beef roll was just a little too much and didn’t bring anything exciting to the table. The seared fatty salmon nigiri was simply incredible, and I’m not even a huge salmon fan. The fish was lightly seared, bringing out more of the flavor while melting in your mouth. 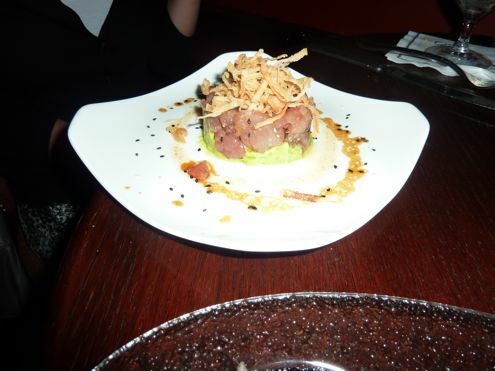 We were tempted to order another but instead got the tuna sashimi. Honestly, I wasn’t too impressed with the quality of the fish and considering that we had a similar tuna dish earlier in the night, I should have just went with my gut and got that second order of salmon. Lesson learned, I suppose. 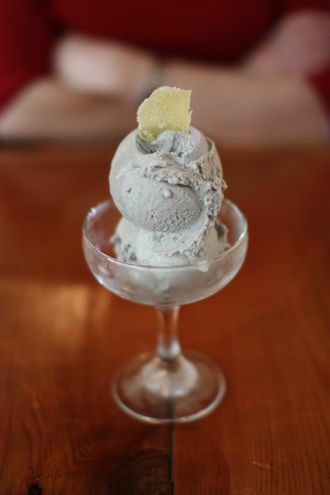 Just when we thought we were done, I was able to convince Rachel to split an order of the black sesame gelato. The only tip I can give you is this: order this as your dessert. There were hints of what tasted like peanut butter as we dug away at the generous scoops in what rapidly soon became an empty glass bowl. 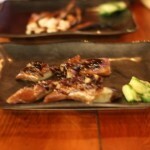 Overall we had a great time during our first visit at Kushi. Granted, we went a tad overboard with how many plates we ordered, but the LivingSocial deal allowed us to sample more of their menu without taking such a hit in the wallet. This is a place that you need to visit several times as there is so much to choose from. 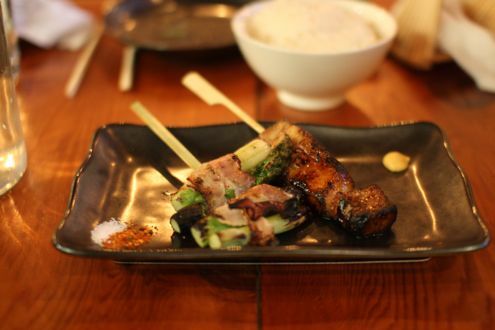 All I know is that the pork belly skewers will be on the bill each and every time we visit. With my 30th birthday coming up, I knew Rachel had something up her sleeve. I just didn’t know when, and importantly, where we would go. We started this tradition of surprising each other back in ’09 when we got engaged with a dinner at CityZen which was unbeknownst to Rachel until we literally arrived at the Mandarin Oriental. From there, we took turns at who could one-up the other with surprise meals at Volt’s Table 21, Restaurant Eve, and Sushi Taro. This time, however, I had let my guard down. Considering that my birthday is May 19, I had no idea that Rachel’s plan would be executed a little more than two weeks prior to my 30th. 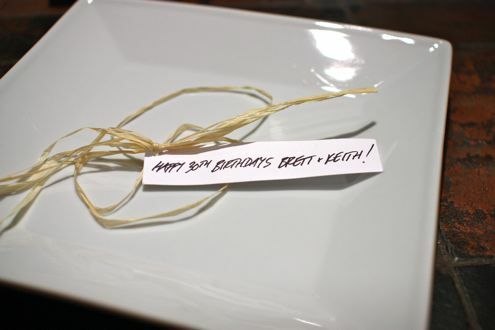 As it turns out, she secretly collaborated with our friend Casey as her husband Keith also recently turned 30 in order to surprise us both. Essentially, everyone was in on the plans except the husbands. Coincidentally, I had asked Rachel what I should wear Friday morning since she had mentioned about going to Hank’s Oyster Bar for happy hour later that evening. Considering that I typically dress down on casual Fridays, it fortunately turned out that my wardrobe choice was optimal for where we were eventually going to go for dinner. 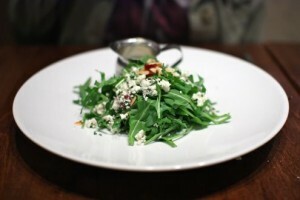 Once we had met up with our friends at the Dupont Circle Metro, we made our way towards Hank’s. And then we passed it. Confused, and with the girls staying silent, I thought that maybe we were going to Agora instead. Once again, everyone continued walking until we reached the steps of Komi. And then we stopped. Needless to say, I was completely taken aback. And then really, really excited. Rachel and Casey just pulled one of the greatest coups by not only securing a reservation for four at one of the best restaurants in all of DC, but by keeping it a secret for well over a month! My wife and friends are so awesome. Komi isn’t like most restaurants. They don’t even have a menu. Diners simply take a seat and are taken on a whimsical journey of some of the best food you’ll ever have in the District. 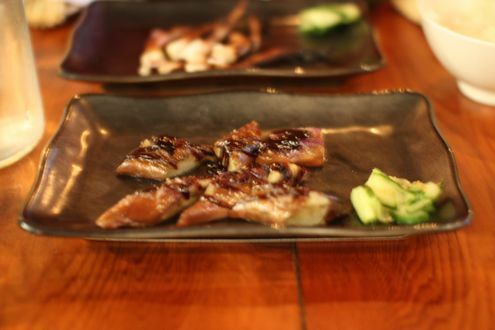 Considering that Komi disallows its patrons from taking pictures of its food, I apologize in advance for the lack of images as some of the plates they served were visually stunning. I also want to apologize if I don’t go into full detail about each of our many courses as there was simply too much to remember and, well, I didn’t write everything down. Anyway, our meal started off with several amuse-bouches, or small bites. The first was a brioche bun with Greek yogurt, sea beans, and salmon roe. With one bite, I could tell that this was going to be an exceptional evening. It was only going to get better from here. There were two other crudo dishes that followed, but I honestly can’t remember all of the details. I do recall that they paired one of the crudo with the freshest beets we have ever tried. The scallop two ways was up next – one served in a shell, and one on a spoon. I preferred the one on the spoon over the shell in terms of taste, but they were both great. The next course featured burrata cheese with asparagus. It’s hard to explain this dish given the complexity of the flavors, but somehow, it just worked. 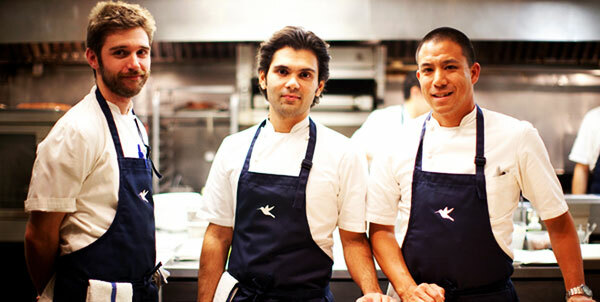 Chef Johnny Monis is obviously a master of his craft. After that we were served salmon with crème fraiche and a toasted chip. Now we’re talking! It was like a deconstructed version of bagels and lox. An abundance of flavor found in such a small package. The small, savory plate of smoked foie gras (served chilled) was terrific. Served with black trumpet mushrooms, pea shoots, and strawberries, it wasn’t a generous portion by any stretch, but it literally melted in your mouth. The foie gras that was atop the tuna at the Inn at Little Washington, however, holds a dear place in my heart. Their take on Spanikopita was so creative – the ingredients were liquidly infused inside a crispy ball while rightfully acknowledging the original Greek dish. The portions began to increase at this point. Up first was one of Komi’s legendary dishes – their take on a DC staple: the half-smoke. I have long heard about how Chef Monis’ recipe is an ode to the District, but let me tell you, this one knocked it out of the park. Using sausage, grounded in-house no less, tucked inside a housemade toasted bun, and then topped with tomato marmalade, the half-smoke was exceptional. 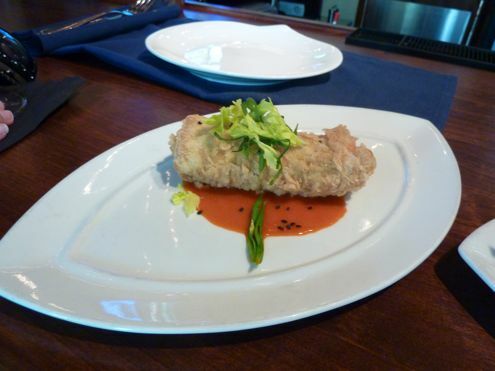 But wait, along with a homemade pork rind seasoned with Old Bay, Komi paired the dish with a Lagunitas IPA! Just brilliant all around. It was at this point that we spotted the chef himself serving dishes in the dining room. Let’s just say, Rachel was swooning about as much as she did over Mr. Voltaggio at Volt. The roasted dates stuffed with mascarpone cheese. Wow, just wow. Unanimously one of our favorite plates of the night. The sweet and salty combination was flawlessly executed with this dish. I could have eaten a table’s worth myself. The egg yolk ravioli with shaved tuna kicked off the pasta course. My word was this delicious. While watching others cut theirs in half where the egg yolk drained out of the pasta, I instead ate the entire piece of ravioli whole. Granted I wanted to ration it, but this way I was able to enjoy every last drop of yolk stuffed inside. Our waiter then served us tagliatelle with seafood ragu and fried caper berries. The pasta, prepared in-house of course, was fine and delicate while the cod added some nice flavor to the dish. It might have been lost in the shuffle coming off the high that was the half-smoke and ravioli, but the excellent pasta, as well as the ragu, stole the show. Then, it was time for our main course. The table received two massive plates of meat: one was Katsikki, or roasted goat shoulder, while the other was suckling pig. It also came with four pieces of wonderfully prepared warm pita bread that were so fluffy that they nearly resembled the texture of pancakes. Additionally, we received two plates of “condiments” which included the best tzatziki we have ever tasted (and we’ve been to Greece! ), picked radishes, olive horseradish spread, roasted red peppers, and lemon salt. The four of us then concocted our own gyros using some of the finest quality ingredients courtesy of Komi and their kitchen. Based on Keith and Casey’s recommendation (they had been to Komi before), they suggested that I try the suckling pig skin first. Crispy, salty, and savory is all I can say. Meanwhile the actual meats, both pig and goat, were incredibly tender and so full of flavor that I almost felt bad adding any toppings. All four of us were in heaven while going to town on the two plates. They even provided an additional set of pita and condiments so we wouldn’t have to waste the small amount of goat that was still on the serving dish. With the entrée being a hard act to follow, the cheese course featured a miniature biscuit stuffed with housemade Mizithra cheese. The cheese was light and mild and was a nice way to bring us down from the highs that we incurred from the previous course. After the cheese course, our waiter presented a cardboard box (adorned with me and Keith’s names) which contained, as our waiter described, a homemade take on ROLOS. If only the real ROLOS tasted this good. I popped one of these cardamom-scented treats in my mouth and the caramel contained inside was of a caliber you typically do not find in Hershey assortments. On top of that, the chocolate used made Komi’s version all the more memorable. What followed next was a dish composed of olive oil gelato, balsamic-glazed strawberries, and a lemon shortbread cookie that each couple shared. So refreshing and refined. The next dessert, which was our favorite of the night, was the chocolate square infused with peanut butter, caramel, and sea salt. Holy moly, words alone cannot do this dessert justice. It was just that good. The crunchy, salty texture of the square was one of the best flavor combinations for a dessert I have ever come across. Simply heavenly. This alone would have been amazing, but accompanying the sinful dessert on the same plate was caramelized banana with coconut sorbet. While also delightful, it just didn’t compare to the chocolate/peanut butter/caramel/salty goodness. Our final course, which was more of a take-home treat, was their elderberry lollipops – one for each of us. We skipped on the wine pairings and instead got a bottle of white, red, and dessert wines throughout the evening. Komi even had Grande Reserve Naoussa by Boutari, a winery we visited while in Santorini during our honeymoon last year. It goes without saying, but we have to mention how amazing the service was throughout the meal. The way Komi works is that there is no set waiter, but instead we were graced with several different staff members tending to us throughout the night. We seemed to have a main server who started off the evening, as well as a sommelier, but at one point we looked like we wanted another bottle of wine and within a minute someone else was on hand to take our order. Our waters were refilled as soon as they were half empty, and a fresh napkin was brought out or refolded within seconds of someone leaving to go to the restroom. There was definitely a laid-back vibe and we thoroughly enjoyed hearing some of our favorite artists in the background during our meal. Without a doubt, this was the best meal we have ever had in DC proper. After years of hearing about Komi being the top restaurant in the District, we finally have justification to backup that very same claim. I am fortunate to not only have dinner at one of the most celebrated restaurants in all of Washington, but to also spend my 30th amongst my wonderful wife and close friends who conspired behind this great surprise. I cannot express my gratitude enough. Rachel’s birthday will be quite the challenge come November. Last week was the week of fulfilling our Groupon and Living Social deals before they expired, so we started at Sushiko in nearby Chevy Chase. We have never been to either of their locations, but heard that their Chevy Chase location was a lot swankier than the Glover Park one. Unfortunately we had accidentally made a reservation at the wrong location, so we had to wait 30 to 40 minutes until a table opened up, which was understandable for a busy Saturday night. Before long, we were sitting in a booth with drinks in hand. I ordered the refreshing lychee martini and was tempted to order several more given how delicious it was. The three of us decided to split several dishes amongst ourselves, and I was ultimately in charge of picking them. In total, we had the edamame, a small plate of seared lobster and scallops with mushrooms and spinach, as well as the spicy tuna and sashimi roll, spicy rock shrimp and cilantro roll, eel and mango roll, and the soft-shell crab roll. There isn’t much to discuss about the standard edamame, other than to say it was a good start to the meal but overly salty. 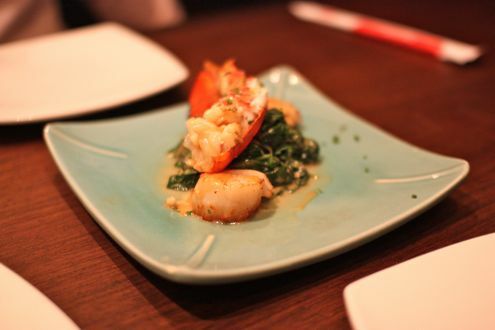 The lobster and scallop dish was decadent with a cream sauce; we just wished there were more of it to go around. 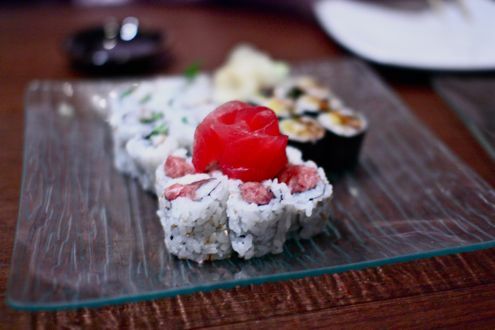 Each type of maki we tried was unique. The spicy tuna roll was something that most people are familiar with, but the chefs added a twist with pieces of tuna sashimi placed on top. The eel roll was a solid combination of sweet and salty as each bite tasted a little like candy. Meanwhile, the rock shrimp roll had a nice kick with the added jalapeno peppers, which didn’t overpower the fresh seafood. 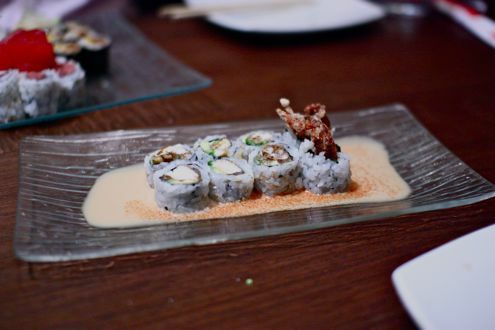 Their signature roll (which our waitress recommended) was the soft-shell crab roll, and while it was crunchy and full of flavor, it didn’t necessarily wow us as much as they described. 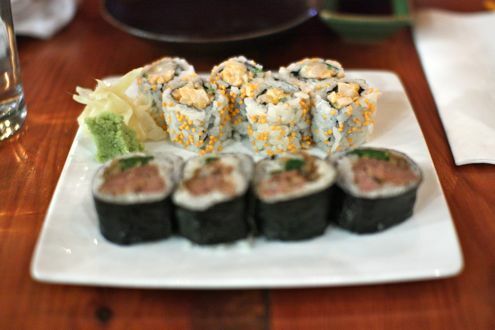 While all the rolls were relatively small, they were high in quality and freshness. We can’t believe it’s taken us this long to visit Sushiko and would definitely return to try more of their fun and adventurous rolls. 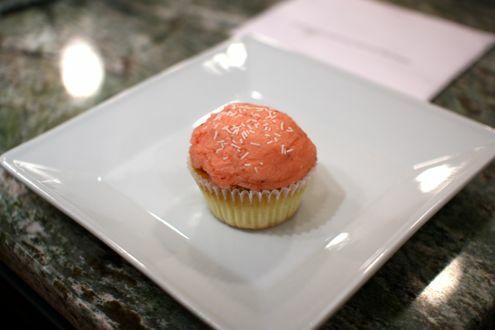 In the crowded cupcake field in DC, one would think that once you have tasted the most popular cupcake names, there is no point searching for new cupcake shops. Or at least, that’s what we thought when we finished dinner a few weeks ago and were walking around Friendship Heights. We wanted to get some dessert and I remembered that there was a relatively new cupcake place called Frosting in a somewhat hidden location behind the Metro by the Giant. We couldn’t find it right away, and Brett wasn’t too enthusiastic about searching for it given the fact that we have four cupcake options in Bethesda alone. However, I was determined to give Frosting a try, and they welcomed us shortly before closing for the evening. There were no long lines or large signs describing each treat, but we liked what we saw right away. There were some creations that looked out of this world, like the Frenchie (French toast cake topped with maple buttercream) or the Elvis Pretzely: The King of Choc and Roll (Pretzel cake topped with milk chocolate ganache, pretzel crumbs and coarse sea salt). 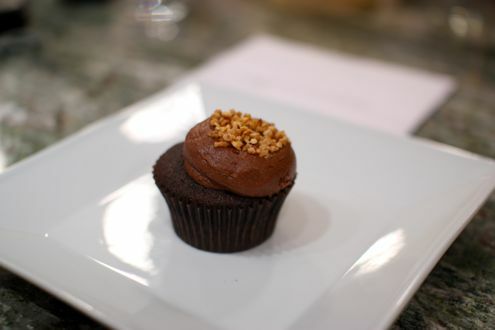 They also featured miniature cupcakes, muffins, and cakes as well as an extensive coffee and espresso menu. We finally decided on the Telly Belly (chocolate devil’s food cake with Nutella-buttercream and caramelized hazelnuts) and the Strawberry Blonde (vanilla bottom with strawberry buttercream top). One thing we noticed is that, unlike their Georgetown counterparts, they don’t overdo it on the frosting. Yes we know, ironic given the name of the establishment, but here it was quality over quantity folks. The frosting didn’t overwhelm the cake and was just the right amount, which didn’t leave us feeling sick or incredibly guilty after. Somehow, we totally missed the store’s one year anniversary last week, but we hope some were able to take advantage of their free cupcake promotion and the cupcake eating contest! When you visit the store, you can also purchase a copy of “The Icing on the Cake”, a romance novel based on the owners. Todd Bracken and Michelle Snow’s love story was originally written about in the Post when they first got married, and the publisher of their book was so intrigued by their tale that they approached them about the idea of a novel. Regardless of the story, we think the cupcakes speak for themselves. If only they didn’t have to compete with Georgetown Cupcake, Crumbs, Hello Cupcake, Red Velvet, Sprinkles, Baked and Wired… you get the idea. Just a couple of foodies who, after being together in the Washington area for nearly a decade, are still in awe of all the new culinary adventures that are ahead of them. 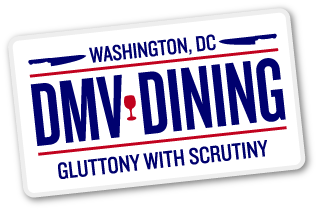 Join us as we discover new restaurants, revisit old favorites, and dig up the latest food-related news in the DMV. Oh, and please try not to salivate on your keyboard. © 2019 DMV Dining. All Rights Reserved.